Nearly 100 parking spots are about to disappear in Downtown St. Pete after city leaders opted this week to keep bike lanes, and nix half the parking spots along an 11-block section of 1st Avenue North and South. 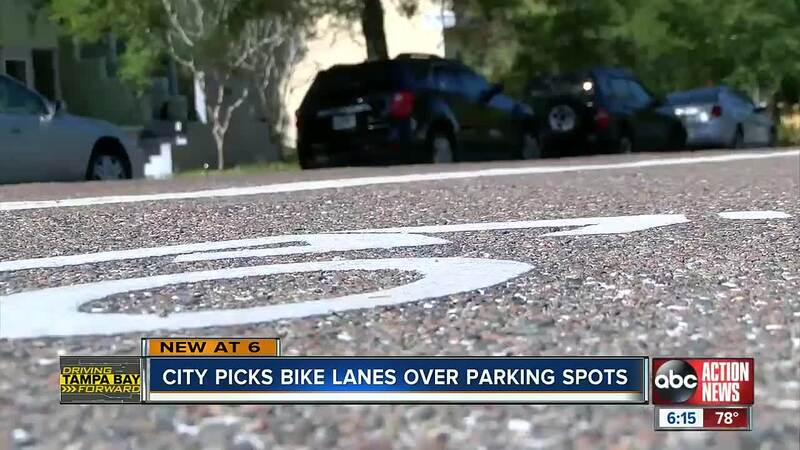 ST. PETERSBURG, Fla. — Nearly 100 parking spots are about to disappear in Downtown St. Pete after city leaders opted this week to keep bike lanes, and nix half the parking spots along an 11-block section of 1st Avenue North and South. It's encouraging news for Jonathan Woelber and his wife. They put in a lot of miles on their tandem bicycle, but to stay safe, they stick to routes with a bike lane. “I would say I feel at least 100% safer on roads with a bike lanes,” he explained. St. Pete is redesigning streets with cyclists like the Woelbers in mind. As they get ready to make room for a new rapid bus lane on 1st Avenue N and S between 20th and 31st Streets, city leaders were forced with a tough decision: Get rid of nearly 100 parking spots or the bike lane. Ultimately, they chose to keep the bike lanes. “That’s really important because I’ve seen people get hit,” Lyn Van Voorst said with excitement. Voorst works at the Clay Center of St. Pete on 1st Avenue S.
Yet, the decision is infuriating for Ed Carlson. “It's insane! It’s absolutely nuts,” he exclaimed. Carlson’s group “Citizens Against Lane and Parking Loss” is taking their fight to the streets by holding to let drivers know about changes like this along St. Pete streets. “It’s insane to lose lanes and parking when we have a city that’s growing and growing,” Carlson said with a sigh. “This traffic-snarling idea is being forced on the taxpaying citizens of St. Pete without a vote,” Lubin says. St. Pete leaders want to add wider, safer bike lanes to 15 streets across the city. In many of those cases, it means driving lanes or parking must vanish. The citizens against lane loss say they would rather see bike trails constructed instead of taking away driving lanes. City leaders say it’s a choice they’re forced to make as Florida continues to lead the nation in bikers and walkers getting hit.